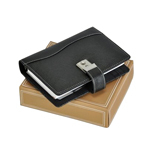 Diaries serve as great gifting options due to their high utility value. Exalon Promotion offers you a wide variety of diaries to choose from. Having these diaries and Business Organisers is like having your own Personal Secretary!